If you’ve followed my writing over the years I analyze the NHL (and filled in the gaps with the Coyotes coverage during my beat reporting days) and its goings on. I never passed myself off as an insider and that won’t change. My observations so far this season is analysis based on writing, research, and reporting on the NHL for many years including this one. These are some things you should keep in the back of your mind as the season progresses. Gretzky’s NHL Blackballing – It’s clear with the announcements of the inclusion of Wayne Gretzky in the NHL’s 100th season celebrations, their blackballing of him (for driving the Arizona Coyotes into the ground forcing the NHL to take over ownership) has been lifted. Yes, he is the greatest NHL player of all time. That cannot be disputed. However, I wouldn’t give him the keys to my shed let alone the keys to another franchise’s hockey operations…at any professional level. The. NHL. Is. Faster. – If you’re wondering why a team may be hot one second and cold the next, one thing to keep in mind that even in the last three to four years the speed of the NHL has risen astronomically. I’m not talking about fast skating and such. I’m talking about the way players process the game moment to moment, pass to pass, and shift to shift. Some players and teams may have NHL level skill sets but they may not have the ability to process lightning fast decisions that need to be made over the course of a game, a week, or a season. Before judging players or teams in the negative (the Vancouver Canucks come to mind) ask yourself if the reason for their poor performances is because they do not have the ability, as a team, to make lightning fast decisions game in and game out. John Scott All-Star Game fiasco – If you follow me on Twitter, you know I was one of the most vocal parties when it came to how things transpired. Let’s face it, this was the public relations cluster fucks of all cluster fucks not only with the Arizona Coyotes but the NHL as well. When this whole mess started, the way the Arizona Coyotes handled it was right out of their archaic steeped-in-old-school-media playbook. After working with the PR staff for the Coyotes over the years they have shown me that they don’t know the difference between their butts and their elbows when it comes to a gift of positive online based PR with the John Scott All-Star game voting. The Coyotes reaction as well as the NHL’s reaction (along with the asinine John Scott Rule they just implemented) showed one of the main reasons why the NHL hasn’t risen to the level of the NBA and NFL in popularity – they aren’t ready, open, and willing to move out of their ‘old school’ thinking and ways into the modern era. The All-Star game is one of the most boring events in sports and fans know this. The fans showed the league they wanted to make the game fun by adding a different element to the game. The league responded by showing that they don’t like fun (to say they were really pissed off over this whole John Scott All-Star Game fiasco is the EXTREME understatement of the century). This has to change. The NHL and the Arizona Coyotes had the gift of all positive Public Relations gift dropped square in their laps and they let it slip through their fingers. The way the NHL and Coyotes handled the situation and John Scott’s trade was like watching a spoiled child’s tantrum and then getting his way. Scott handled the whole incident like a professional and his performance in the All-Star Game was watching Karma in action (especially with the Coyotes rightfully not having anyone represent them in the game). The Vancouver Canucks – As noted above due to the insane amount speed in the game currently, one of the things people need to keep in mind is that the Canucks simply do not have the bodies to be able to process the game at which the speed is moving. Willie Desjardins has a job of taking lemons and turning them into lemonade and in a hockey rabid town like Vancouver, the Fans in the Lower Mainland and across British Columbia are quick to set fire online to players, coaches, and front office staff on a regular basis. Trevor Linden inherited a mess that was left neglected dating back to the Brian Burke era (below) and its going to take sometime to get the team back on the right track. The Canucks history – I’ve been following the Canucks very closely since the Burke era, especially when it comes to the hockey operations of the franchise. The mess that the Canucks have across their franchise started back when Brian Burke was at the helm trying to turn around an almost exact scenario that they have now – Fans not coming to games, the franchise lacking talent and prospects and a need to turn it around NOW. Burke’s job was to put butts in seats with a budget and he did that…at a cost. The cost was to mortgage the future for success in the present. A cost that is being dealt with by Trevor Linden today. The GM’s between Burke and Benning (Dave Nonis and Mike Gillis) didn’t really do much as one never got to put his stamp on the team when presented with a literally empty prospect cupboard (Nonis) and other (Gillis) pissed away assets and never retooled the team following their Stanley Cup final run. Needless, to say Trevor Linden inherited a complete and utter mess that is almost on the level of how Wayne Gretzky drove the Phoenix (now Arizona) Coyotes into the ground. Most fans don’t get this and probably won’t. Vancouver Canucks are projected to finish dead last in the NHL. I stand by my tweet from earlier this season where I said that they will finish higher than the Flames in the standings. Glendale, Arizona – What a mess this whole Coyotes/Glendale/Westgate thing has become. Instead of rehashing the story yet again, I offer a different angle. Pretty much everyone doesn’t know what the whole purpose of this project was to be. The Greater Phoenix, Arizona is unlike normal metropolitan areas in that they don’t have centralized downtown (or anything centralized for that matter). Everything is so spread out across the valley and that includes destinations for people to spend their time. Back in the 90’s the City of Glendale and business leaders had a vision to make the Westgate area a destination like Scottsdale, Tempe, Chandler etc was and is today. The original vision of the Westgate area stretched out way beyond the Stadiums and shopping complexes and was to include much, much more housing, entertainment and so on. However, 9/11 pretty much derailed the full vision of what Westgate was to become and the powers that be decided to make a smaller version of their original plans. The main item that the City of Glendale (along with everyone else) lost along the way was to make their city a destination for the region. In the Glendale City Council meetings that pertained to the Phoenix (now Arizona) Coyotes ownership battle, the City leaders clearly did not demonstrate this vision which tells me that original vision of making Glendale a destination got lost along the way. Arizona State University football – This marks year five of the tenure of Coach Todd Graham. During his introductory press conference (below), I asked him if the goal of the program was to win a national title. I asked him that question for a reason. Given the point in time that he was hired, mediocrity in the entire program was accepted year in and year out. Kids growing up in the greater Phoenix area didn’t grow up playing football imagining they were playing for ASU. They grew up pretending to play for other national powerhouses. Top talent in the state were going to the bigger schools and not staying in state. This was a problem with the program and the Athletic Department. For ASU to be a winning program, they had to start at the grassroots level with kids camps and community outreaches to build a winner. If there’s one thing regarding his performance that he should be judged on (this past seasons on field performance should be ignored due to the insane amount of injures they had) is how the program across the board should be judged in reference to building a sustainable championship program for years to come. Arizona State has done just that but it will take some time before they see the fruits of their labor. Autobiographies – As I’m writing this I’ve got a collection of Genesis live albums playing on the headset (‘Duchess’ on ‘Three Sides Live’ is wicked and hearing Phil Collins sing the 24 odd minute ‘Supper’s Ready’ and not Peter Gabriel is oddly satisfying) as a result of reading the new autobiography by Phil Collins. I recommend the book but my only knock on this book so far (up to the 80’s and his Live Aid performances) is the lack of detail about how the Genesis albums from ‘Duke’ through their self-titled album came to be. His solo albums are written with great detail, especially how ‘In the air tonight’ came to but his Genesis albums lack the detail of the writing and recording process and seem to be just blips on the radar. I’m also reading the autobiography of Bruce Springsteen and he’s as good or better of a writer than he is a storyteller in concert. I’m up to the recording and touring of the ‘Born to Run’ album and I’ve also been exploring his studio and live back catalog which is amazing given the detail of how his life up to the points of his albums came to be. I HIGHLY recommend both books if you’re fans. On East Coast time – I gotta admit after watching about ten seasons worth of games on the left coast and In Arizona it’s weird watching games on the right coast and adjusting to the times that games are on. It could be worse, you could be a Pac-12 fan like myself where games have started as late as 10:30 PM in the East. Anaheim Ducks forward Ryan Getzlaf will not play tonight in Dallas against the Stars due to appendicitis. The Ducks and Pucks blog first reported he flew back home to Orange County today for his surgery which is scheduled for tomorrow. According to the Anaheim Ducks press release, Getzlaf will be out for approximately 4-12 days. The Anaheim Ducks also said that Getzlaf has had ‘discomfort intermittently over the last six weeks’. In eight games this season Getzlaf has scored one assist on the struggling Ducks roster who are 1-5-2 and only six goals scored this season. This begs the question, if this is his problem with his lack of production, why wasn’t this discovered earlier in training camp? By the time you read this, the Columbus Blue Jackets will have started the 2015-2016 NHL season 0-7. They have allowed 34 goals and only scored 13 through these seven games. It’s amazing that a professional hockey team has started the season 0-7 in such dramatic fashion. What’s wrong with this team?!?!? Now I’m sure you can pick apart players and come up with line combinations until the cows come home. However, the Blue Jackets problems break down into three areas (below). Until these three areas are fixed no General Manager will be able to fully determine what Blue Jackets positions need upgrading. Until the team turns the three areas noted below around first, they’re not going to be able to do much of anything productive on the ice. After allowing 34 goals in just seven games it doesn’t take a rocket scientist to figure out that the Blue Jackets could not stop pucks going in. If ever there was one goal that summed up their defensive zone issues, it’s this one from their home game versus the Toronto Maple Leafs last week. At the five second mark I want you to watch how ALL five players are down in one area leaving the Leafs point men wide open. Also note how the defensemen are watching the puck and not the players behind them. Then note how the point men are wide open. Yeah. Now imagine this happening 34 times over seven games and you’ll get the picture of why the Blue Jackets are in the mess they’re in right now. Normally, a defending player would take a quick glance back to see if the opposing players away from the puck (left side of the screen) are sneaking into a scoring position like they did here. THIS kind of defensive lapse is a coaching problem especially if it happens repeatedly over seven games. Todd Richards and his coaching staff could not stop goals like this from happening. This alone was justification for his termination. This is some of the worst case defensive zone discipline I’ve ever seen on an NHL team. 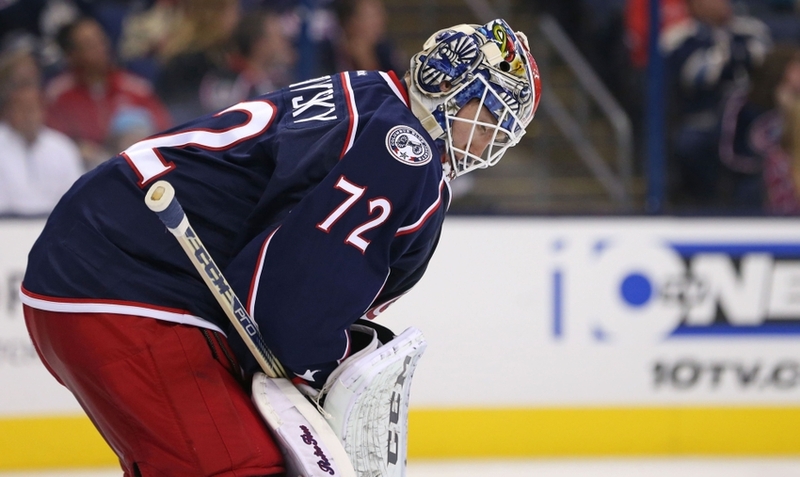 It’s well known Blue Jackets goaltender Sergei Bobrovsky told the media that he’s lost his confidence. Let me show you an example of this. Just watch and note how he wasn’t ready for this shot on goal and how he reacted too late. The CBJ coaching staff simply can't stop the bleeding. If this happens again tomorrow against CHI, I can't see how Richards keeps his job. There’s not a lot that can be done here as it’s up to Bobrovsky to work through his confidence issues. He’s a great goaltender but he needs to get back to believing he’s a great goaltender. The Blue Jackets lack of mental strength or confidence is a team wide issue. Over the course of the first seven games you could see the confidence of the entire team erode as each of the 34 goals the Blue Jackets allowed were scored. A goal would be scored and the team’s confidence and their performance went down hill quickly. It’s tough righting a sinking ship when the ship has so many holes in it that have been ignored. Until the new coaching staff solves this, there’s just going to be more of the same. With the hiring of John Tortorella as Todd Richards replacement, people are speculating if this is the right hire for the team because the franchise has been sinking hard and fast for a few years now. This team needs a winner now. I personally don’t think he is the man for the job based on his performance in Vancouver along with the stories from other members of the NHL media (specifically TSN’s Gary Lawless on the radio yesterday) I’ve heard from about the way he coached (or didn’t coach) there. He was also an extremely poor assessor of talent and wasn’t able to put together lines to help alleviate the scoring pressure off the Sedin Twins line. To stop Tortorella’s Canucks, all you had to do is shut down the Sedin Line and watch lines two through four not be able to hit the broadside of a barn with a puck. The Canucks had talent to provide some help but Tortorella could not figure out who could do the job for him. HUGE red flag here. What people should look for here is to see if he’s changed his ways from his time with the New York Rangers and the Vancouver Canucks. The Blue Jackets need a coach to crack the whip and lead them out of the darkness of losing while developing young talent. The Blue Jackets don’t need a coach who can’t relate to players or properly assess the talent he has on his roster. Finally, the Columbus Blue Jackets need a coach who can teach and guide the players through the challenges of the three points I made above. Can John Tortorella do this job? That remains to be seen. As you may or may not know, Arizona Coyotes captain Shane Doan is the final year of his contract, and is in his 19th NHL season. Doan is also the longest active serving Captain in the NHL and is in the last stages of his storied career. While Doan has spent his career with the same organization the chances of him lifting the Stanley Cup are getting slimmer and slimmer as this season progresses. Many of you may have seen some of his great performances for the Jets/Coyotes as well as playing for team Canada. What you haven’t seen over the years is how he has gone above and beyond the call of duty for the team and the Greater Phoenix area. During the Coyotes ownership circus, he’s spoken up for the team and their fans so many times that I’ve lost count. There’s been many times over the course of this circus that he could have bailed for a different team. Each time he’s stayed put in Arizona. Then add to that the undying support of all the Coyotes fans near and far while having to endure the constant barrage of whether the team will be staying or going. With that don’t forget the sensationalist Canadian media timing negative articles to damage the team as they’re trying to rebuild the franchise. Some of the articles that came out of Canada over the years bordered on lunacy and the abuse the fans have taken was and sometimes still is pretty brutal. I’m not going to link any of these articles as you can find them all on Google pretty quickly. On top of that, there’s a possibility that Shane Doan may not re-sign with the Coyotes next season (this is just speculation). Finally, let’s not forget that for over six years now the NHL has promised an All-Star Game to Coyotes fans after the 2006 All-Star Game in Phoenix was cancelled due to a work stoppage. Six years ago today @NHL Deputy Commissioner Bill Daly promised the NHL All-Star game would come to the area. We’re still waiting Bill. NHL needs to find a way to not only thank Doan for going above and beyond the call of duty during the past six years of the ownership saga but also come up with something for the fans who have gone through insane amounts of abuse and trials during this time. I mean most fans would have bailed during the unprecedented ups and downs of the ownership saga yet they didn’t. They stayed and they’re happy now that the team is staying. Mr. Bettman, make a ‘Commissioner’s Selection’ to the 2016 All-Star Game for Arizona Coyotes Captain Shane Doan. Since the logistics involved with bringing the NHL All-Star Game to the Phoenix Area probably won’t happen during Shane Doan’s career why not have him be one of the Coyotes representatives to the All-Star Game? Plus, have him be one of the Captains during the player selection process. Everyone outside the State of Arizona may not ‘get’ why this is needed Mr. Bettman but the Coyotes fans, many of whom you’ve met personally over the years, need this. They deserve this. Shane Doan – 2016 All-Star. It’s got a nice ring to it, doesn’t it? Now that the new season is underway it’s time to take a look at five teams that need to have a better season than their 2014-2015 results. For whatever reason last season, these teams couldn’t put things together and fulfill their maximum potential. Keep an eye on the teams below as the season progresses. The Ducks are at the top of my list for one reason – they were built to win it all last season and failed to do so mostly because of their own laziness. With about a third of the season remaining and the playoffs clinched, the Ducks took their proverbial foot off the pedal and coasted into the playoffs. The coasting and just plain lazy habits that resulted in inconsistent play was so bad the Ducks TV broadcast team brought this topic up regularly during games. What happened come playoff time shocked even me – their laziness and inconsistent play carried into the playoffs. The Ducks never played a full sixty minutes of hockey coasting for 20 or more minutes per game. As I see it, the Ducks got lucky in the first two rounds as they faced Winnipeg and Calgary who had way too many injuries to field even the slightest opposition to the Ducks. Had either of these teams not have any injuries, its quite possible that the Ducks would have been eliminated in these rounds. This may not be related but it needs to be said. One of Ryan Getzlaf’s biggest knocks against him when he was drafted was his inconsistency. It makes one wonder if this habit has seeped into his captaincy in the playoffs last year and if the Ducks can overcome this laziness if it happens again. The Ducks this season need to figure out if they’re really the fierce team they appear to be on paper or the lazy team that we saw the last third of last season and the playoffs. The Winnipeg Jets are an average team. There. I said it. They have an average roster, average goaltender, and an average General Manager who seems happy with his average team’s mediocrity year in and year out. Not really fair for one of the best fan bases in the league to have to deal with this year in and year out. This team seems to be happy with mediocrity as opposed to wanting to win a Stanley Cup this season. What is Winnipeg’s goal this season? More of the average? Because if that’s the case, it’s not going to be long before the fans will speak their minds by not purchasing tickets. It’s time for the Jets front office to grow up, take this team mired in mediocrity, and take the next step up. Upgrade the roster, replace their goaltender, do something to show their fans that the Jets are here to win it all and not just play average hockey year in and year out. Now let’s be real here. I am not (and I’m sure no one else is) expecting the Oilers to make the playoffs this season. Given how messed up the franchise was for the past eight plus seasons the bar needs to be set really low here. While everyone will be focusing on Connor McDavid (the Oilers 2015 first round draft pick) they need to watch how the team around him progresses, especially the forward depth. The expectation for the Oilers this season is to compete on a nightly basis and show everyone they have turned the corner from the train wreck they were in seasons past. I have a feeling the corner has been turned with this team for the better. 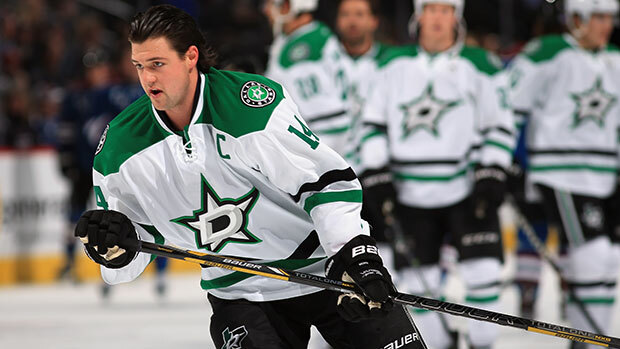 Jason Spezza, Patrick Sharp, Tyler Seguin, Ales Hemsky, Jamie Benn, Johnny Oduya, Antti Niemi. This team is built for one reason – to leave a path of death and destruction on their way to winning the Stanley Cup. This team can win it all. However, last season they fell short of making the playoffs for numerous reasons including the shoddy play of goaltender Kari Lethonen. Missing the playoffs is inexcusable this season. So is an early round exit from the playoffs. I’ve been watching the Islanders closely for many years while General Manager Garth Snow has been slowly and patiently rebuilding the team from within. The Islanders have turned a corner from being the leagues door mat to a team that has the potential to not only make the playoffs but do some damage in the deep rounds. At this time in the history of this franchise the Islanders are in the perfect moment that they’ve been working so hard for many years to attain. They’ve changed the culture, they’ve built a winning roster, and now they’re playing in a new arena. This season it’s time for the Islanders to not only win the division but to go deep into the playoffs. Sure it’s a tall order given the competition in their division but with the potential of this season’s roster, its a very realistic goal.